Cheapest Robot Coupe R301 Ultra on the internet? Is it really the cheapest Robot Coupe R301 Ultra on the internet? We’re confident that we’ve got the best price on the internet. Have a look yourself and if you can find it cheaper, like for like, we’ll do our best to match the price. If you’re looking for the cheapest Robot Coupe R301 Ultra on the internet YOU JUST FOUND IT! Head straight over to the Robot Coupe Machines Online shop click HERE to visit. It may sound too good to be true but it’s not. We’re listing more and more Robot Coupe Machines on our site every day and we realised that we’re fast becoming the cheapest dealer in the UK for Robot Coupe Machines and parts! The R301 Ultra price really stood out so we’re giving it a little push to get things going! More amazing deals coming very soon! The new vegetable preparation attachment consists of a lidded vegetable preparation bowl. Both the bowl and thelid can be removed for cleaning. 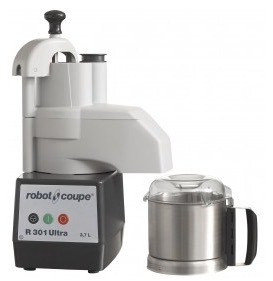 When you’re ready to buy the cheapest Robot Coupe R301 Ultra on the internet – head straight over to the Robot Coupe Machines Online shop and let’s get your kitchen cooking!